Don't get me wrong: I love savory and sweet food combinations. But there's a point where creative pairings go too far, resulting in monstrosities like this. Clearly trying to wage a war on taste buds, instant ramen company Nissin has decided to turn their dorm room staple into ice cream. The frozen science experiments are being served at the Nissin Cup Noodles Museum in Yokohama, Japan. 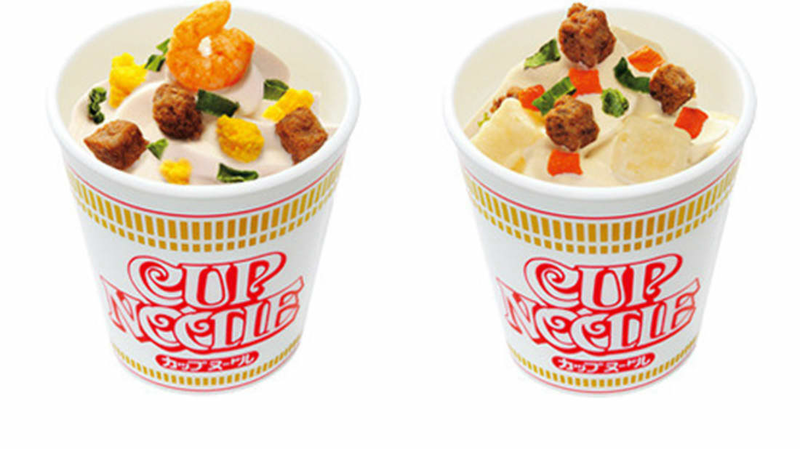 For 300 yen you can pick up an iconic styrofoam cup filled with ice cream, and topped with instant ramen freeze-dried toppings, including shrimp, beef cubes, green onions, and egg. It's unclear how strong the ramen taste will be in the bizarre dessert, but given that there are actual pieces of beef cubes on top, it probably isn't subtle.